This magazine also features great poetry from Vince Rodriguez, James Michael Shoberg and H.H Bond. 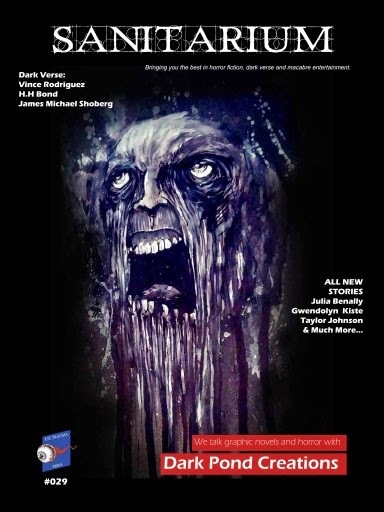 There's some great articles on everything horror related such as zombies, splatterpunk and interviews with Wayne Simmons and Dark Pond Creations. This magazine is out on the 20th of each month, you can buy your copy from Amazon. A tale that grips you from the first line and never lets go. Everyone loves a good vampire tale and this is one of them. Style is similar to Bram Stoker's epic Dracula, told via a diary mixed with a smattering of Lovecraft's impending doom. This is a great horror tale where Charles Martin creates fear from the unknown which does not evaporate, even at the end. Who is the mystery woman? A ghost from his past, or a creature coming for his future? A sci-fi tale in which anyone and everyone has the chance to explore what had previously been impossible. In this alternate world people can go back in time. They can live out their fantasies giving them a break from the mundane realities of the world they live in. Except not all fantasises are the same and the Scarlett R. Algee questions what would really happy if we could all live as we chose without any constrictions of rules? Makes you wonder how far some people will go when they can do whatever they want in their fantasies. most dream of love and happiness but a few dream of death and destruction. What happens to certain people when they are allowed to explore their dark sides and urges? Are they different to us would we all do the same if we had the power to do so? Should we be afraid of what's in our heads or what awaits outside? Are the darkest recesses in our minds just as dark as shadows and nightfall? Isaak Stoake's tale explores one of the greatest fears of all; loneliness and being left on your own, of feeling afraid in your own home where you should be warm and safe. After reading this you'll never want to be home alone again. Stoakes masterful skills at writing and creating tension are exhibited throughout by taking a mundane situation such as a "night in" and making it incredibly unsettling. We're left wondering whether it was all in his head or was IT there all along? "I know how to make everything better." Except you know it's about to get a whole lot worse. Which is worrying, their daughter is already dead, the worst thing that could happen to anyone. So how exactly can things get any worse? With this tale you know you're in for a grisly ride. Who is this mysterious Carl and why is he amused at such a sad funeral of a child taken too soon? Truth is you find yourself wanting things to get worse for Megan who disgustingly shows no remorse or pain. As creepy as Carl is you're secretly rooting for him. This is a tale about the slow drawn out death knell of a relationship. What would you do to keep your true love? How far will you go for someone you love unconditionally? What does it mean to love unconditionally? But this is no ordinary tale, it delves into the darkest depths of desperation. Everyone has a warm happy place lost in the annals of their childhood. If you returned there seeking sanctuary would it be the safe haven you rembered and cherished? Or would it be something dark and sinister? Spinster Eskie's tale warns about disturbing the ghosts from your childhood, reigniting the forces that make you feel trapped and the dream of escape. A strange tale of the one eyed king who takes more than he should, set in an alternate reality. Highly imaginative Taylor Johnson's tale is of someone "waking up" seeing their life and world for what it really is. Desmond is able to see behind the illusion and sees that the person he loves is in grave danger, but is it too little too late? A highly original tale that twists and turns keeping you enthralled.